It started out as such a good day | Can I Bring the Dog? All the errands on the list, and more things, were accomplished. Then in the middle of the afternoon, things went wrong, and we ended up at the vet. That left eye isn’t looking so great. Chico put a hole in his eyelid, thankfully there was no damage to the eye itself. Our wonderful vet, Amanda Rizner, didn’t get back to her office from a farm visit until after 4, and she and her tech Brian stayed until almost 6 to patch Chico up. He was too stressed to go into the office willingly, so she came out into the parking lot to do the initial exam, and she gave him his first dose of anesthetic – his “happy puppy shot” – out there and let him rest in his crate while it took effect. She let me watch her clean the wound, examined his eye and found no damage, and put in one stitch to the wound in the lid. A dissolving-thread stitch. Home with some pain killers and oral (this is no time to teach acceptance of funny-smelling things coming at your face) anti-biotics. I am thanking the universe it turned out as well as it did, feeding Chico anything he wants to keep the antibiotics from hitting an empty tummy (yes, he’s playing “what else have you got?” and today I am buying it), and headed for a good night’s sleep. For both of us. 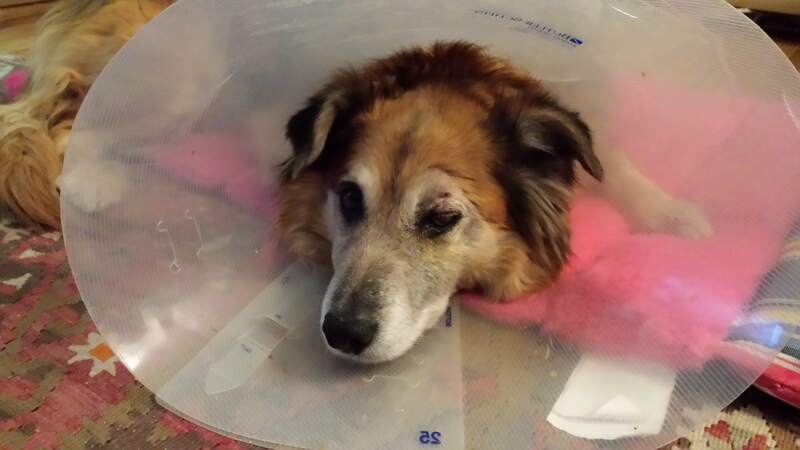 This entry was posted in Uncategorized and tagged Amanda Rizner, great vet, hurt dog. Bookmark the permalink. Aw, the cone of shame! Love and speedy recovery little guy! Ouch! Hope he’s feeling better soon!